The Sawyer Utility Wood Oars are our favorite oar for small boats. Wrapped and stopped, these small oars are a great choice for kick boats, pontoon boats or even small dinghies. Sold as a pair. Laminated from specially selected straight grain Douglas Fir for a light, stiff and stable oar. 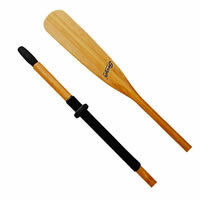 Sawyer Utility Wood Oars are our most popular oars for dinghies and small row boats. Blades have a slight crown for a smooth, controlled stroke.